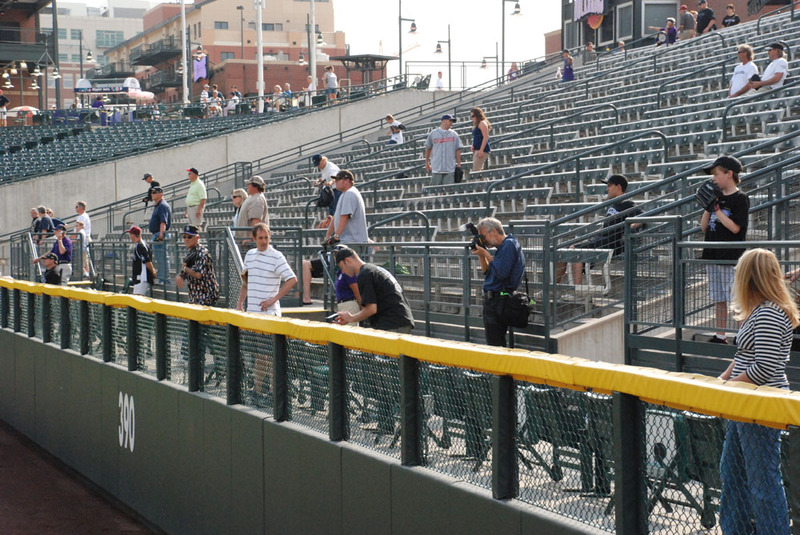 The photographer (David Zalubowski…standing on the right) took pics as I bolted up the stairs, and the writer (Pat Graham…wearing the white striped shirt) sprinted after me as I raced through the concourse and headed to the front row in left field. Within the first few minutes of batting practice, Rockies pitcher Jorge De La Rosa tossed me a ball, and I used my glove trick to snag another off the warning track. In the photo above, there are three important fans that need to be pointed out. The blond woman on the right is Deb Arguijo, the mother of Jameson Sutton who snagged Barry Bonds’ 762nd home run ball. The man to the left of Pat (in the dark cap and flowery shirt) is Danny Wood, the guy who caught Bonds’ 698th home run and robbed me of several BP balls two days earlier. 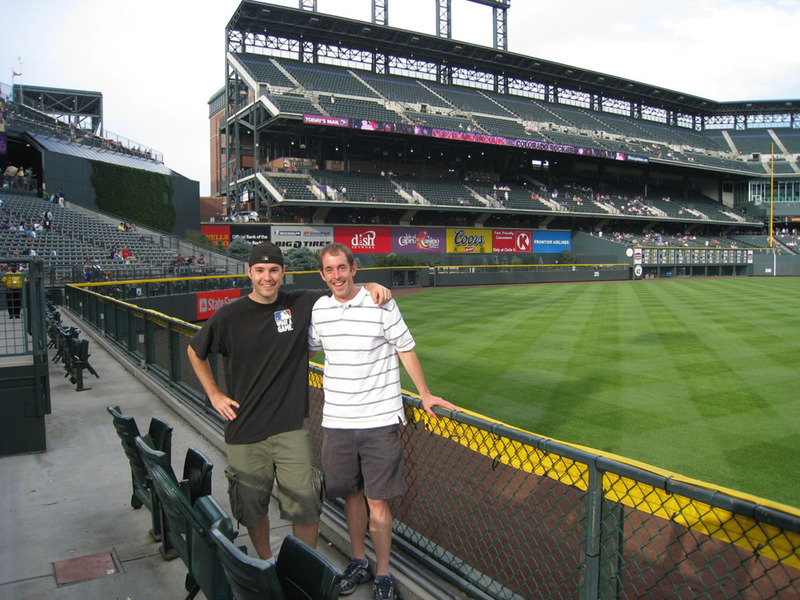 And finally, the guy standing to the left of Danny (in the maroon cap) is Dan Sauvageau who once caught two home runs on a fly in one inning and turned down a request to be on “Good Morning America” because he was going on a golf trip the next day. 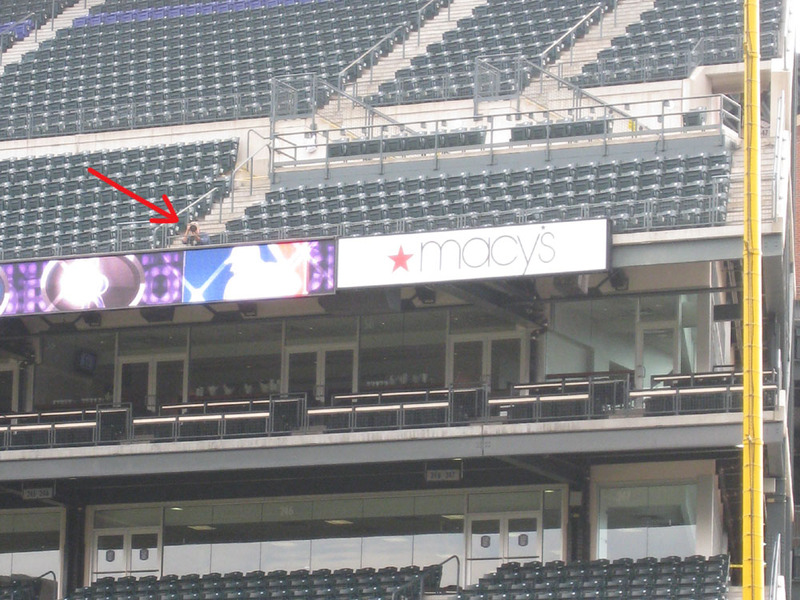 That’s right, he took photos of me from the upper deck. It felt great (and a bit scary, too, I suppose) to know that everything I did was potentially being captured from so far away. …and I successfully prevented him from snagging a single ball. Meanwhile, I made another attempt with my glove trick for a ball that was sitting halfway out on the warning track. I figured the ushers wouldn’t be too happy about it and might even stop me before I got it, but at the very least I wanted to give David another opportunity to take some photos. Well…sure enough, just after I flung my glove out onto the field, I heard someone shout, “Zack!!! Zack!!! Zack!!! Zack!!! Zack!! !” I thought it was another fan, warning me that an usher was coming over, but when I looked up I realized it was the head usher himself. Oy. I apologized profusely and thankfully didn’t get in trouble. He was super-nice. 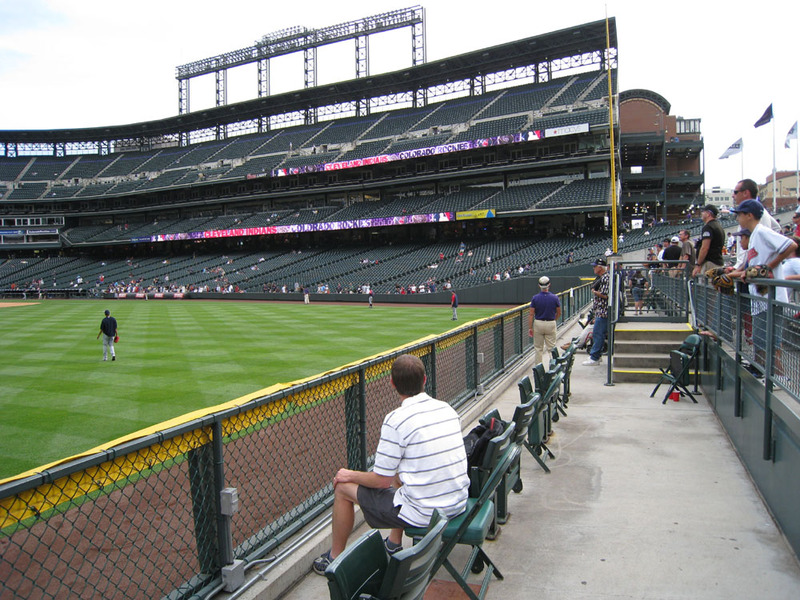 The fact is…there’s a rule throughout Coors Field (it’s even printed in the stadium A-to-Z guide) that ball-retrieving devices are not allowed, and he had to enforce it. The good news is that Indians pitcher Edward Mujica walked over and flipped me the ball. I looked up at David in the upper deck and gave a fist pump, and he gave one back. Success! For some reason, there were a ton of lefties taking BP, and the balls just weren’t flying to left field. I only got one more ball during BP, and it was a line-drive homer that pretty much came right to me. Neither the evil fan on my left nor Danny on my right had a chance to interfere, and I made an easy one-handed catch at the wall. 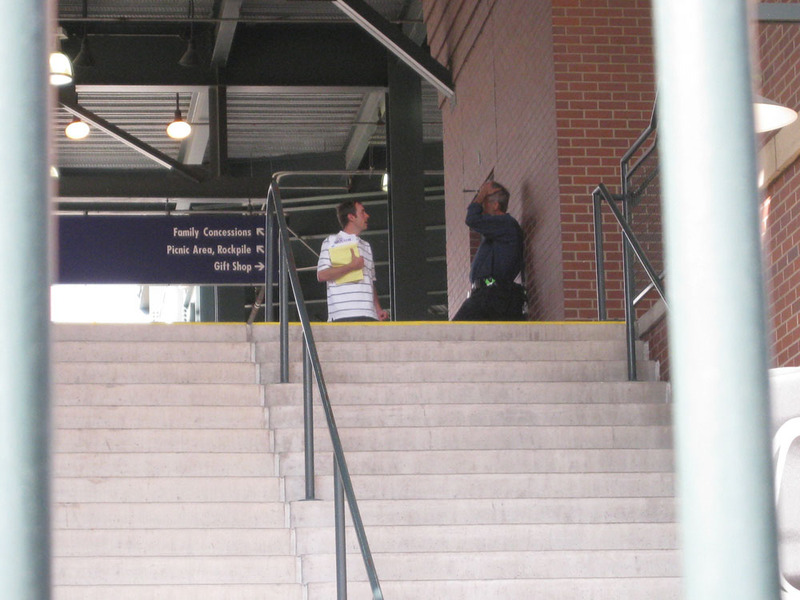 After BP, David returned from the upper deck and took some photos of me holding up my four balls. As soon as he was done, I gave one of them away to a kid with a glove who had gotten shut out. …and we parted ways. He felt he had everything he needed and wanted to get a head start on writing the story. No…the reason I got blanked during the game is that there were only TWO foul grounders that headed in my direction. The first was scooped up by the third base coach (of course) and the second hooked a bit to my right and bounced too far away from the wall. I still had a great view and saw a good game. Laffey picked up his first major league hit. Willy Taveras stole his National League-leading 31st base. Jeff Baker, who had hit an inside-the-park home run the day before, went deep again (this time OUT of the park) and scored three runs for the Rockies who won, 4-2. Brian Fuentes fanned Kelly Shoppach to end the game and record his 12th save, and he tossed me the ball on his way in. Rockies first base coach Glenallen Hill (who once struck out 211 times in a minor league season) also tossed me a ball, and that was it.
? 193 balls in 25 games this season = 7.7 balls per game. In case you’re wondering, the AP story should be hitting the national wire on Friday, June 27 (but you have to understand that I have no control over that). Meanwhile, the Palm Beach Post is putting together a front-page article about Ken Griffey Jr.’s 600th career home run, and since I was five stinkin’ feet away from catching it, they interviewed me. That piece is scheduled to run on June 22. 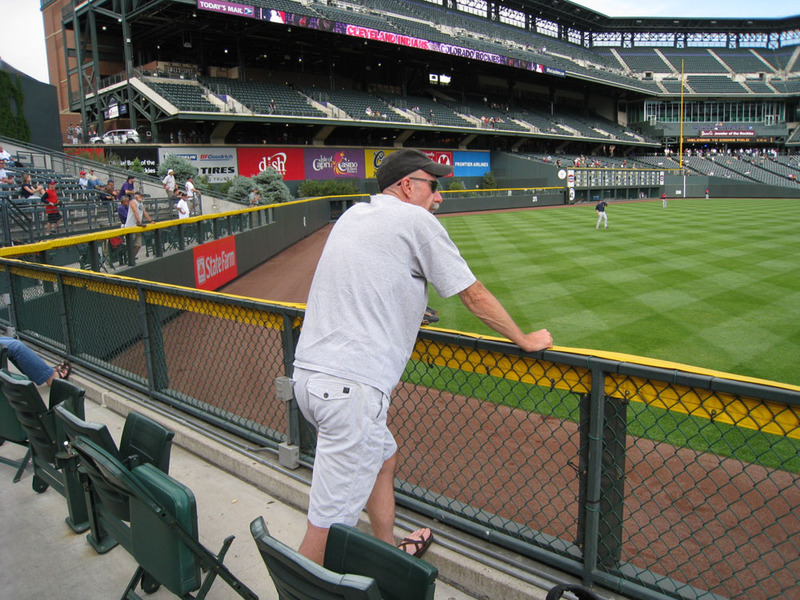 And finally, since I have a few minutes to spare before heading back to Coors Field, I’m going to comb through all the comments on my last few entries and answer everyone’s questions. If you left a comment but didn’t actually ask a question, I won’t respond, only because I don’t have time (and I apologize for that), but know that I always read every comment. June 19, 2008 - 3:49 pm . So your Colorado trip is almost complete. What’s the rest of the lineup for this summer Zack? Quick question is the rock pile isolated from the rest of the park? 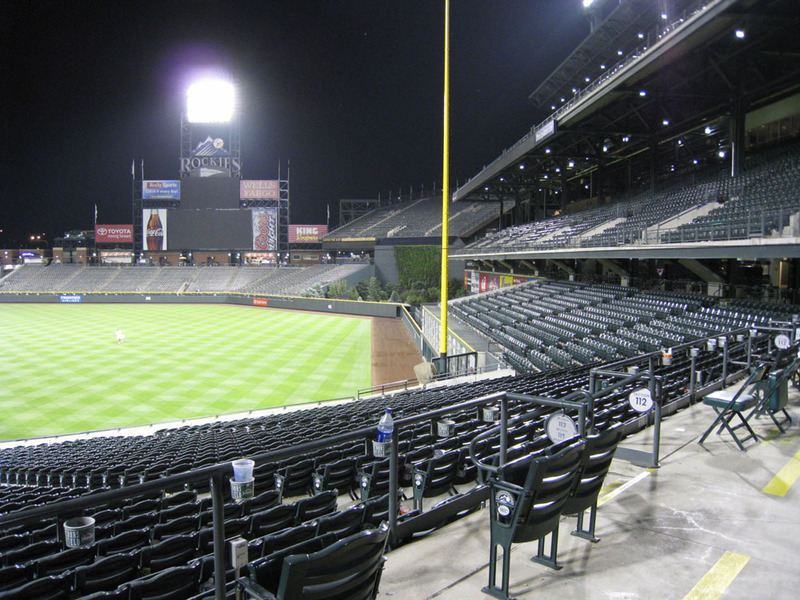 Like the picnic area at shea? Hey, nice job not letting your rival get any, good luck tonight and tomorrow. nope, the rock pile is connected to the rest of the stadium. No major summer plans. I guess I’ll just see what comes my way as a result of the AP story and then take it from there. D’oh! My bad. Just fixed it. I thought it sounded a bit odd when I wrote that. I was gonna answer, but the Puck Man beat me to it. Crap, I can’t go to Philly tomorrow.*****. Well, it’s not that I can’t; it’s just that I’m not. Meh. Zack, can you delete comments from the blog? I guess that wasn’t you, no waldo shirt. too bad!! I’m curious about the Palm Beach Post article. How does that work with you exactly? How did they know you were 5 feet away? Did they call you or did you call them and tell them you were that close and offer a quote or two? Look forward to reading the article. I hope they have some more info about “Joe” and a picture or two. Detroit is in town tomorrow. Looking forward to getting back into action in BP tomorrow. I’d like to have a big snagging day and get back in the saddle. Thanks for the auto info about the Padres. I don’t normally even try for Padres autos during the season. Too busy snagging. I usually get all I need in Spring Training and Friarfest. Here’s my Alzheimer’s moment (I’m 41). I looked through my Spring Training schwag from this year and I already had Headley sign a game ball for me on the sweet spot and a ticket stub. I totally forgot. Duh. Maddux wouldn’t sign for anyone during Spring Training. He must get hounded so much. Yankees fan that read on here…. I am so glad you guys swept us. I really am. It makes me glad I didn’t spend the time and money flying across the country to New York and I hope it showed our fans here and our ownership what a real team looks like with a real payroll. Your line up is filled with all stars and the final score showed it. The Padres are terrible this year and it’s because they won’t make the financial committment to win by signing higher caliber players. Edgar Gonzalez? Paul McAnulty? Jody Gerut? Michael Barrett? Please. Compare that with their Yankees counterparts A Rod, Bobby Abreu, Jorge Posada, Johnny Damon and you’ll see what I mean. One obersvation though from today’s game. I don’t really know who your starter was today. Some guy named Chamberlain. Anyway, his antics on the mound were a bit much and looked unprofessional to me. If he were in the National League and pulled that crap he would be drilled by a pitch as soon as he came up to bat. I was curious if that’s his normal routine when he pitches? Any other thoughts about the guy? Nice Job TC. But, zack did say you are exempt from spelling and grammar rules. Zack, nice recap. Sorry I haven’t posted much lately. 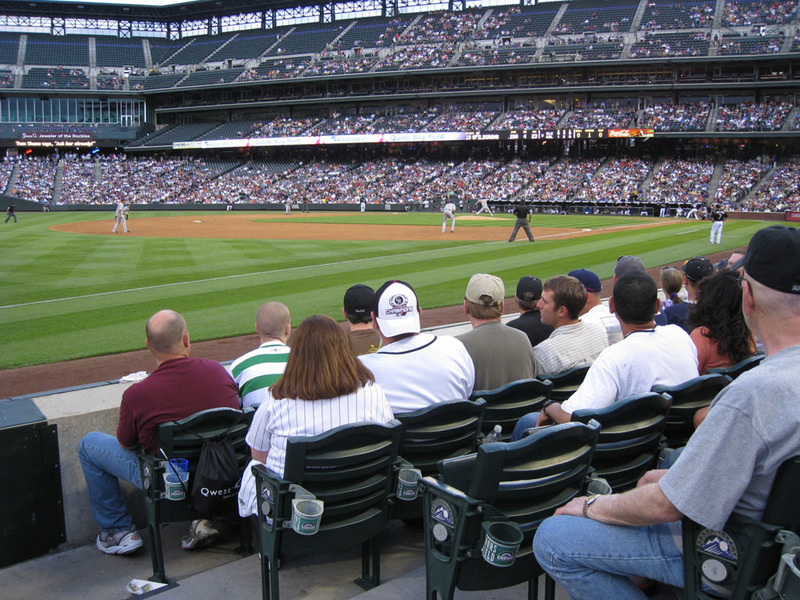 I’m going to be SO jealous of you tonight at the Rockies/Mets game. 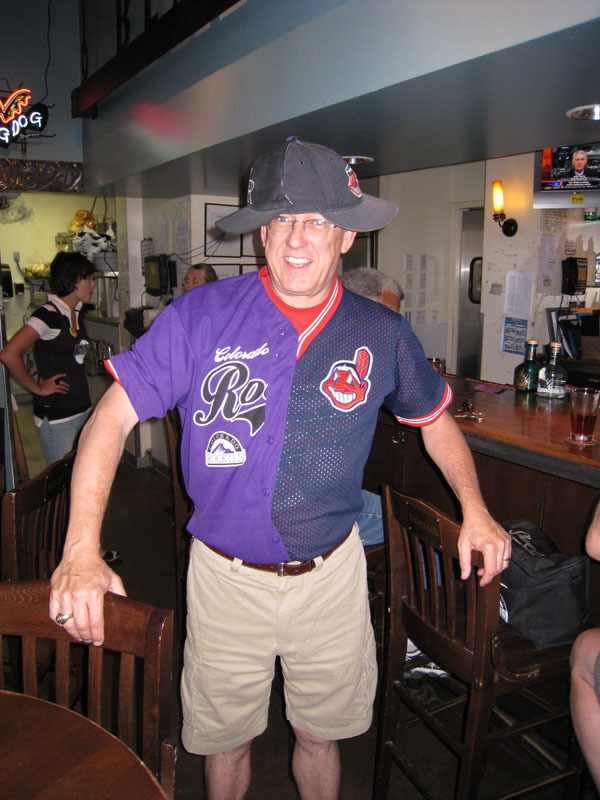 My friend from college lives right near Denver, but I’m heading up to Fenway Park tomorrow (Red Sox/Cards), so I couldn’t fly out there to see her. Zack, I’m curious what your (and others on here) all-star votes look like. I know, I know, Chipper should’ve gotten my vote at 3rd base, but I hate the Braves, and David Wright is my favorite player, so I was biased on that one. Padreleigh, as a Yankee hater, I hate Joba Chamberlain’s antics. He acts like every strike out with 2 outs clinched a playoff birth or world series! Seriously. I’m sure the other Yankees aren’t fond of the antics, but they just aren’t speaking out. Sweet…..Adrian Gonzalez at 1B on your All Star Vote!! Finally, he gets some respect!! I guess I’m old school. If you strike someone out just “act like you’ve been there.” Walk off the mound in a circle or something and get ready for the next guy. 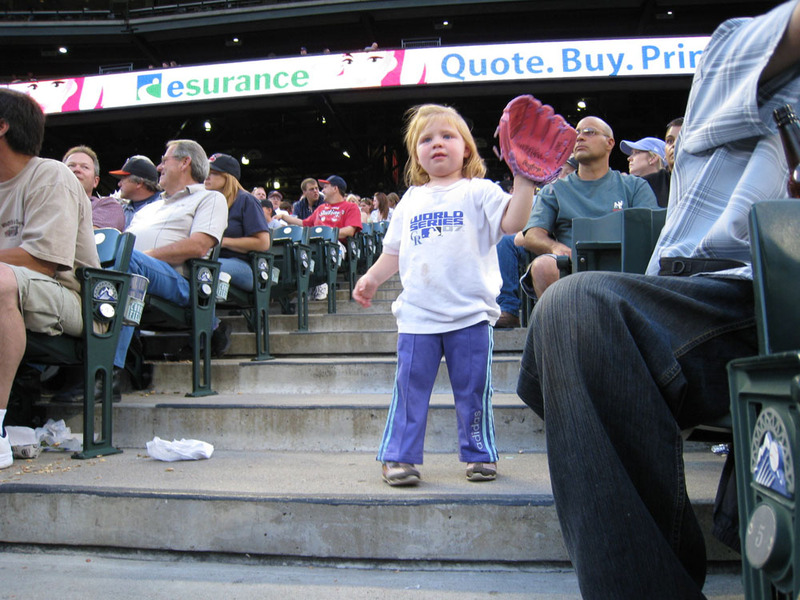 Don’t be staring at the batter, pumping your fist, staring into the dugout, etc. He needs to get drilled. Typical American League pitcher. Sorry Puckcollector. I’ve vaguely heard of the guy, but that was the first time I’ve seen him pitch on TV. I didn’t even know what his name was until they said it. Jake Peavy on the Padres does the same crap alot too. ALOT OF US don’t like it either. I’m surprised he hasn’t got drilled too. Then again, the guy who drills him has to bat too and payback can hurt. Anyway, I’d like to see Chamberlain have to bat and pull that stuff. greg-neither am i. its prety much sold out, no fun. shea wednesday is my next game probably. How do you know it’s almost sold out? As for Wednesday, I should be there also. I might end up having an extra ticket I could give you if you’re interested. Padreleigh, this clip is for you. Joba Chamberlain striking out Frank Thomas on opening day. He did not one, but two fist pumps. Come on dude. Up until 4/1/08, You’ve pitched 24 innings in the big leagues at that point. Show some respect……. PSU, I guess we cancel each other out, since I never vote for a Met and rarely a Yankee lol. Can’t believe Chipper is down to a lowly .395.
padreleigh-your blowing this out of proportion. i love the sox and hate the yankees but it is always nice to see a guy have some emotion and have fun doing what he does. As for the “typical American League pitcher” that is just ridiculous. Not all AL pitchers do these kinds of jirations when they pitch. A “typical American League pitcher” is one that could be average in the AL and go over to the weak NL and absolutly dominate. Give me a break. You have some real valid points. A lot of guys do come over from the American League and dominate. I think alot of that has to do with facing pitchers that bat and ringing them up as a “K”. What I mean by the “typical American League pitcher” is that they can get away with stuff like throwing at guys and doing fist pumps, staring at guys etc because they don’t have to bat. They have no fear of retaliation. That’s what I meant. Hope that clears it up. Man, you really like this guy. You Yankee lover you. Well, some people are going to like the guy and some people aren’t. I guess we’re on both sides. I can’t do the Tiger analogy because he’s a golfer, not a baseball player. I call him Eldrick by the way. Ha ha. oh ok that does make sense sorry about the confusion.